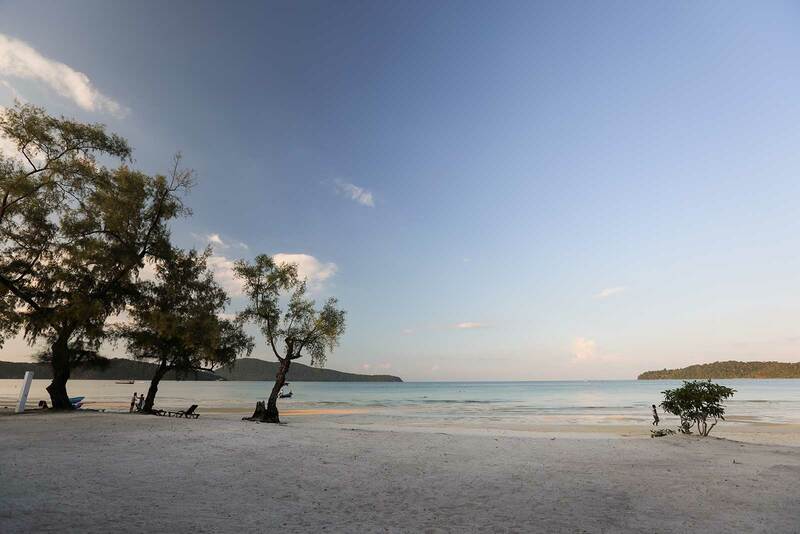 Koh Rong Samloem: Welcome To Cambodia's Paradise Island. | Travel Photography Blog by Nisa Maier and Ulli Maier. 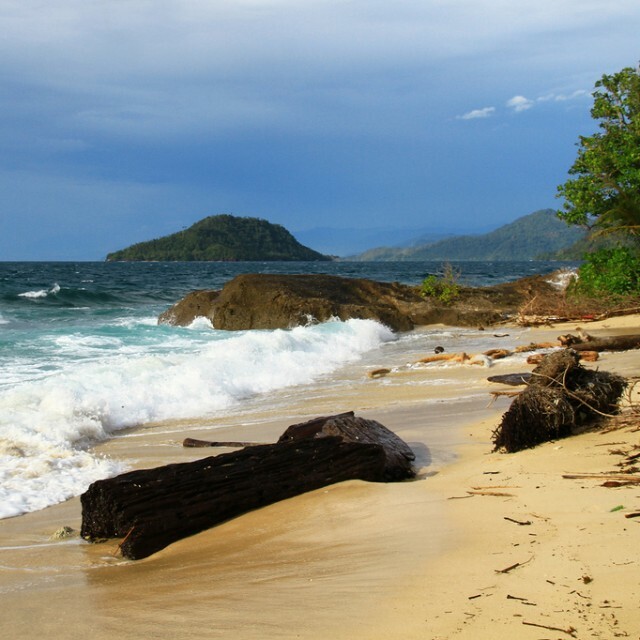 Less than 200 kilometres bee-line lie between Cambodia’s island paradise and the well known beach-neighbour Thailand. Thailand’s picturesque beaches attract millions of tourists every year, but this popularity has its price: finding a pristine, quite spot has become almost impossible. But there are other islands in the Gulf of Thailand that lack of nothing and have not been overrun by mass tourism. One of these is Koh Rong Samloem. Cambodia’s own paradise island is a dream for everyone who has fantasized about tropical beach-feeling, yet still needs some sort of contact to the outer world. 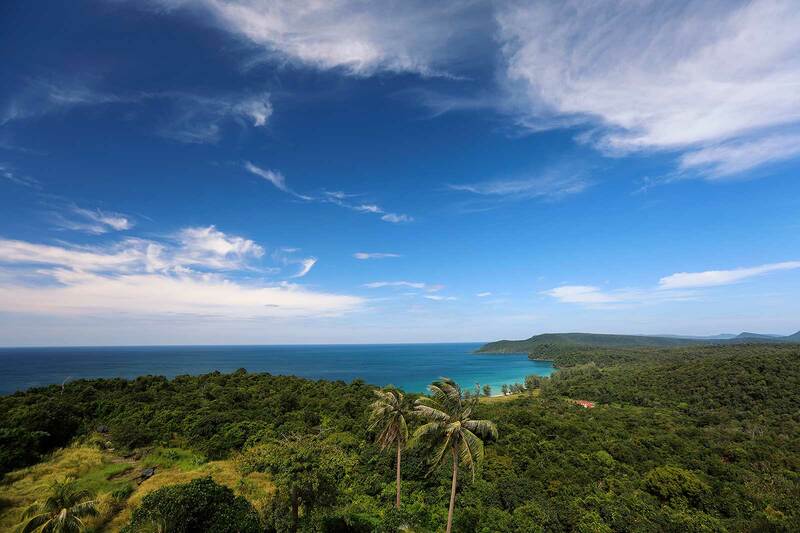 Up from the lighthouse you have an amazing view of Koh Rong Samloem. This island is still as pristine as it was hundreds of years ago and well worth the trip! Just 45 minuted by speedboat from the mainland lie Koh Rong and Koh Rong Samloem. 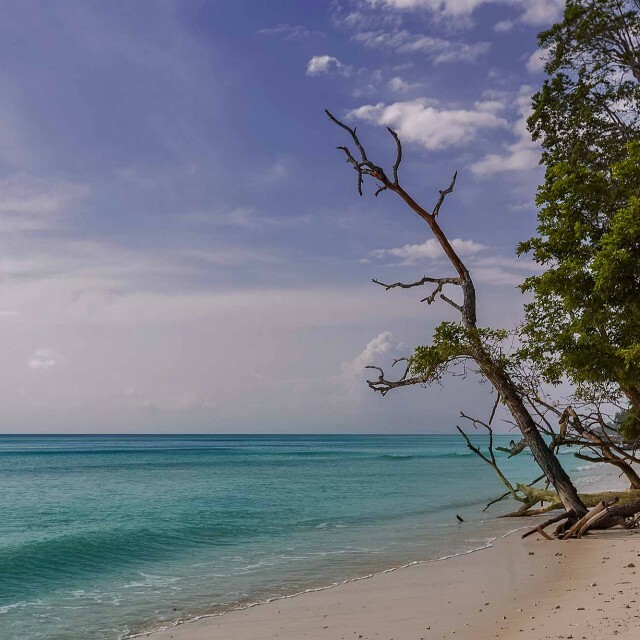 While Koh Rong already has the reputation of a backpacker-party-island, Koh Rong Samloem is still quite unspoilt. Thanks to the lease agreements, which last just for a short period of time (unlike the ones on Koh Rong), larger hotel chains stay away and the beaches are dominated by smaller bungalow facilities. 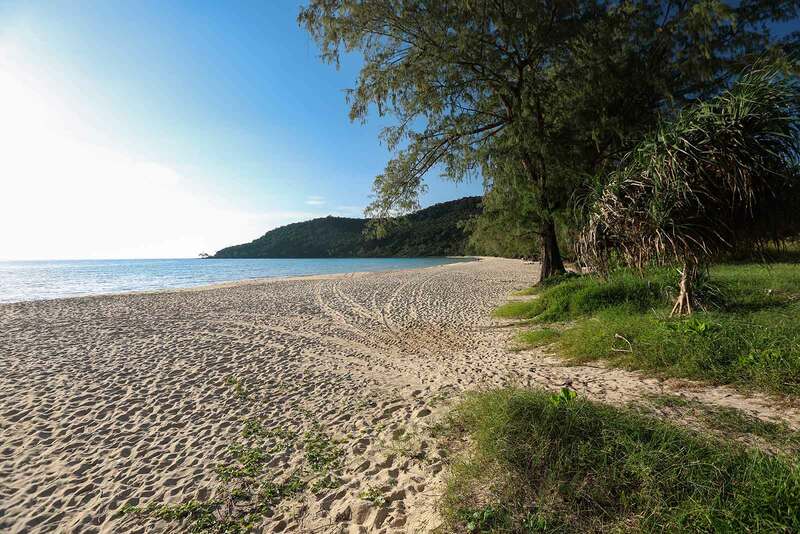 You’ll find four beaches on Koh Rong Samloem: Saracan Bay, M’Pei Bay, Lazy Beach and Sunset Beach. Beach #1 On Koh Rong Samloem: Saracan Bay. Saracan Bay is the main beach on which not only most resorts have settles, but also the main docking station for boats from Sihanoukville is located. One lies on the norther, one on the southern part of the beach. From fairly cheap non-aircon-bungalows to high class villas, everyone will find the right spot. The beach here is white as snow and soft as silk, the water radiates in all shades from turquoise to blue with wonderful 27° Celsius and the vegetation is still as untouched as is was hundreds of years ago. What more could one want?! Unfortunately you’ll still come across people who don’t appreciate the value of such a paradise. When walking up and down, you’ll see certain sections where trash piles up. This is where the hotel managers are challenged, because the resort staff should clean their respective section. This was one of the reason why we chose to stay at Sol Beach Resort. The real winner though was the amazing bungalow with a complete glass front, which gave us an amazing view right after waking up in the morning (detailed review will follow asap). The food here was not a winner (especially not if you’re vegetarian), but the surrounding resorts are a great alternative. Tip: Once you step across the southern docking point of Saracan Bay, trash actually piles up quite a bit, so we wouldn’t recommend booking a hotel down here. Unfortunately the hotel managers here don’t seem to care much for the environment. This is the view we had from our bungalow at Sol Beach Resort on Koh Rong Samloem. Not bad huh? 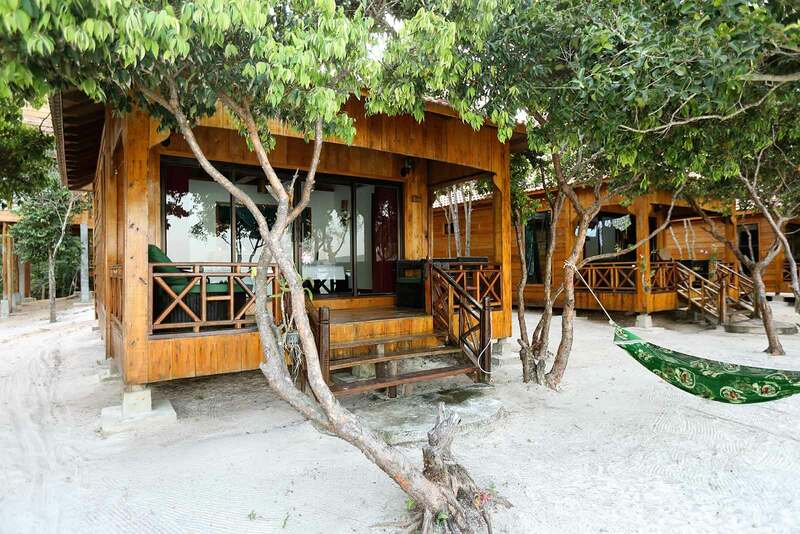 The beach front bungalows at Sol Beach Resort on Koh Rong Samloem are really amazing thanks to their full glass front. This was right in front of GreenBlue Resort on Koh Rong Samloem. The hammocks right above the water are great when the tide comes in. Beach #2 On Koh Rong Samloem: M’Pei Bay. The second beach, M’Pei Bay, lies on the northern end of the island. You’ll come across several smaller resorts, as well as a docking stations for boats here. Also, it’s where one of the two fishing villages of the islands can be found. M’Pei Bay is the second largest beach on the island, yet still pretty laid back. You can hike here from Saracan Bay – back and forth it’ll take you about 5 hours, but the best way to get here is definitely by boat. Beach #3 On Koh Rong Samloem: Sunset Bay. The third player is Sunset Bay, which is also the only beach we didn’t visit. As Lazy Beach, it lies on the western side of Koh Rong Samloem and is more relaxed with only three backpacker resorts and a dive shop. Beach #4 On Koh Rong Samloem: Lazy Beach. Last but not least: Lazy Beach. Our personal island highlight. With just one very basic resort, you won’t come across any masses of people. The 20 minute walk through the jungle from Saracan Bay keeps more crowds away. If you do decide to take on the trip, you won’t regret it: Lazy Beach offers delicious food and drinks and the combination with one of the most beautiful sunsets you’ll ever get to see will leave you speechless. 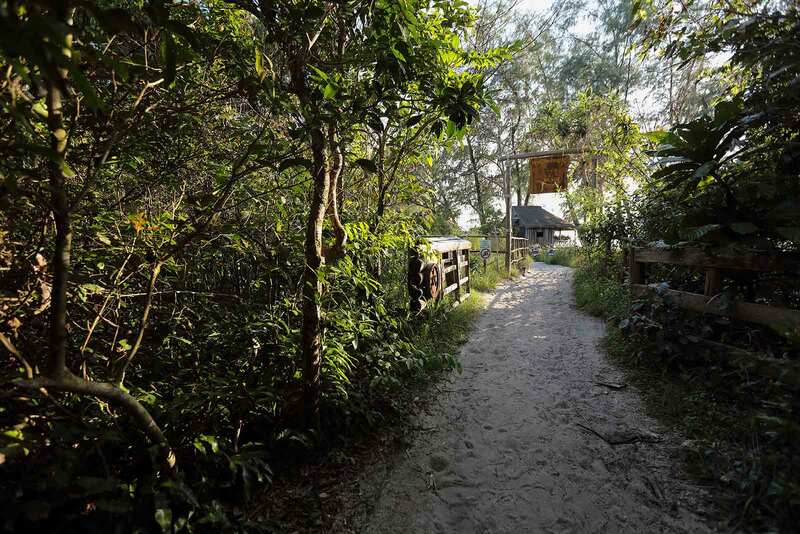 Once you come out of the jungle, you’ll already get a sense of what live looks like at Lazy Beach. White sand, beautiful water and almost no people is what you’ll come across at Lazy Beach on Koh Rong Samloem. The sunset at Lazy Beach was truly one of the most amazing ones we’ve come across. Résumé Of Our Week On Koh Rong Samloem. 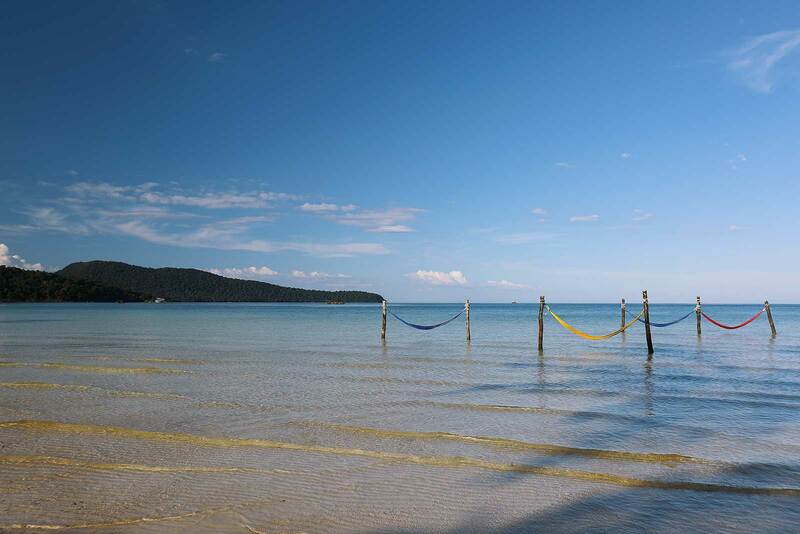 You can spend an unforgettable holiday on Koh Rong Samloem. 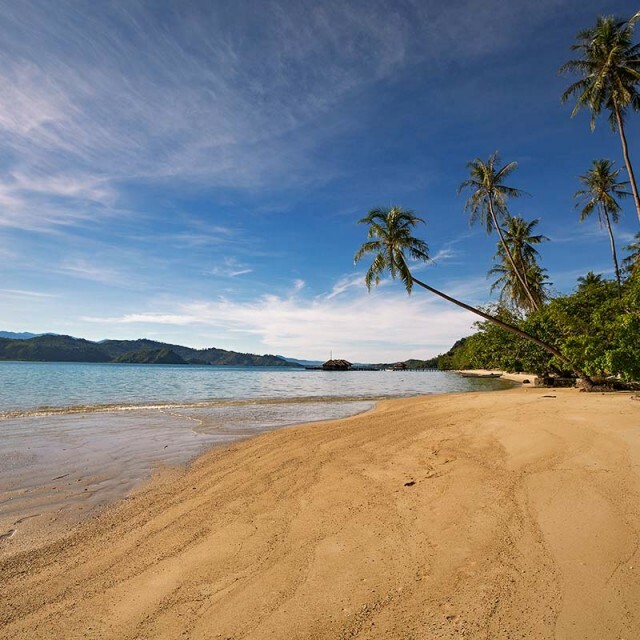 Due to the lack of roads and the presence of only smaller resorts, the island is yet still a fairly unknown spot with the same charm as many islands of Thailand had two decades ago. Those who were here, will tell others and we’re sure that this will mean further changes in the next couple of years. But let’s hope that Koh Rong Samloem will not become another victim of mass tourism, but that it’ll continue being this pristine little island it is now. 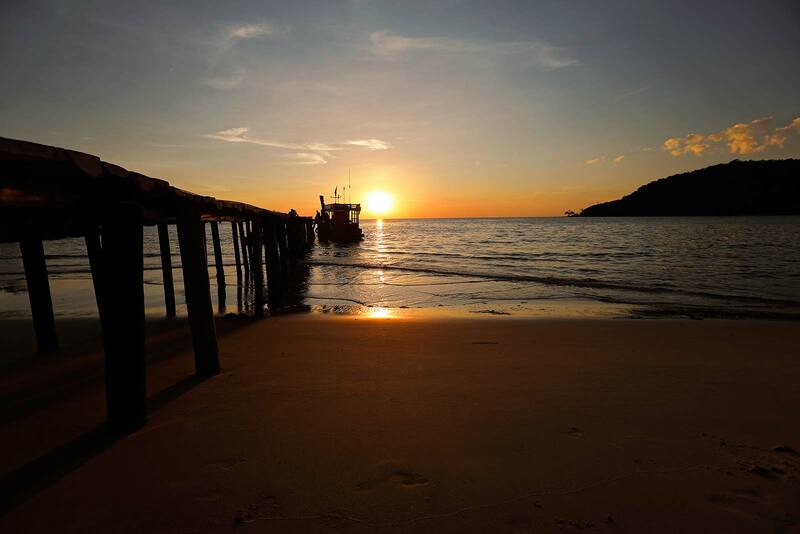 A Few Tips If You Come To Koh Rong Samloem. Be sure to calculate enough time for the crossing, because depending on which company you go with, you’ll either stop at Koh Rong to let of/let on people before or after. Boats take off at Serendipity Beach Pier in Sihanoukville and here you’ll get all the relevant infos on which boat goes where and when. There are no banks and therefore no ATM machines on Koh Rong Samloem. Be sure to bring enough cash, because some resorts don’t take credit cards. Prices are really expensive too. Calculate at least double that what you’d pay on the main land – or even better, calculate with European prices. 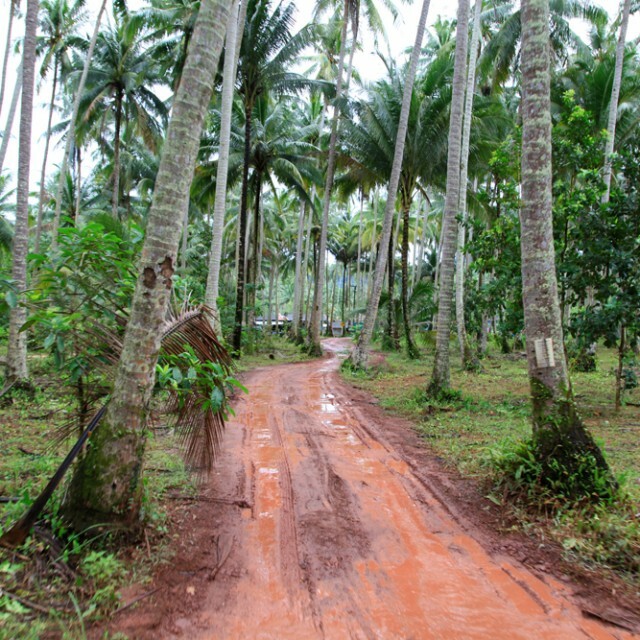 Be sure to bring enough insect repellant and a torch for the nightly walks along the beach(es) or jungle. Definitely check out the lighthouse on the island. Depending on where you start, the trip will take you between 1 1/2 – 2 hours each direction. We’ll write more about this later on.